Learn how Utica’s premium Catholic education can develop the unique talents of your student in a nurturing, faith-based environment. Notre Dame Schools, a private, independent system emphasizing a faith-based education, is hosting its annual fall open house noon to 2 p.m. Sunday, Nov. 4. Students of all faiths are welcome. Visitors can talk to faculty, administrators and coaches, meet students, find a list of student clubs and organizations, learn about tuition assistance and payment plans and more. Light refreshments will be served. The Open House consists of a presentation which begins promptly at the start time and will be followed by tours of the school. Notre Dame is the area’s only Catholic-based education, providing a nurturing learning environment where personal attention helps students develop their unique talents. Its programs are committed to faith formation, academic excellence, and service. At Notre Dame, small class sizes with a student-teacher ratio of 10 to 1, enable individualized attention. Notre Dame’s curriculum complies with or exceeds New York State Regents requirements while offering programs to meet the academic needs of all students. Advanced placement, accelerated courses and tutorial assistance are available. Students have many options and opportunities to participate in interscholastic and intramural sports, music, drama and more extra-curricular activities in the new Willenburg Center. Certified, dedicated teachers stress Christian values in every aspect of the curriculum. Religion classes strengthen the students' understanding and appreciation of prayer, sacraments, scripture, and doctrine. Students are encouraged to participate in parish events and volunteer community service. 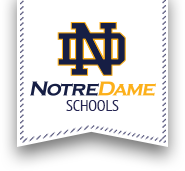 With a 100 percent graduation rate and 100 percent of those students going on to pursue higher education, Notre Dame Schools prides itself on the accomplishments of its students. In 2016 Notre Dame Seniors received $4.8 million in college scholarships. Notre Dame welcomes families of all faiths and brings Catholic values, educational excellence, and community service to all students, so they may become responsible leaders whose lives are rooted in Christian principles. For more information, call 315 749-7060 or visit notredameutica.org.